Are you tired after a long day? - Is your skin dry and flakey? Share Your Pleasure With Someone Else. Give Our Best Premium Luxury Gift Sets for Christmas, Birthdays, Bridesmaids, Shower Gifts or Just As a Gift to Yourself. We Include a Free 6 x 8 Hemp Bath Mitt for exfoliating and Rejuvenating Your Skin. 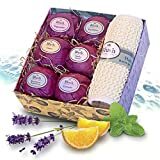 Made With HEALING Therapeutic Grade Essential Oils our 6 All Natural Bath Bombs Will Relax You While Transforming Tired Muscles and Leave You Feeling Refreshed. Individually WRAPPED & PACKAGED BY HAND using the finest All Natural Ingredients and packaged in a custom made elegant gift box that is reusable. We Offer a NO RISK 100% MONEY BACK IF NOT SATISFIED. - Are your Muscles sore and restless? - Epson Salts and Kolin clay soak away stress. - Apricot oil, organic Shea and Coco Butters moisturize your skin and leave it feeling awesome. - Therapeutic grade essential oils will awake your senses and leave you refreshed. - Six assorted Bath Bomb scents each infused with a different essential oil blend. Lavender,Eucalyptus, Vanilla Cream, Peppermint, Citrus, and Eucalyptus with Peppermint. The reviews are pouring in and people are raving about the quality and presentation of our product. We guarantee your satisfaction and will refund you 100% of your money if you are not in love with them. ORDER SEVERAL SETS NOW for someone special. Sale price is for a limited time.